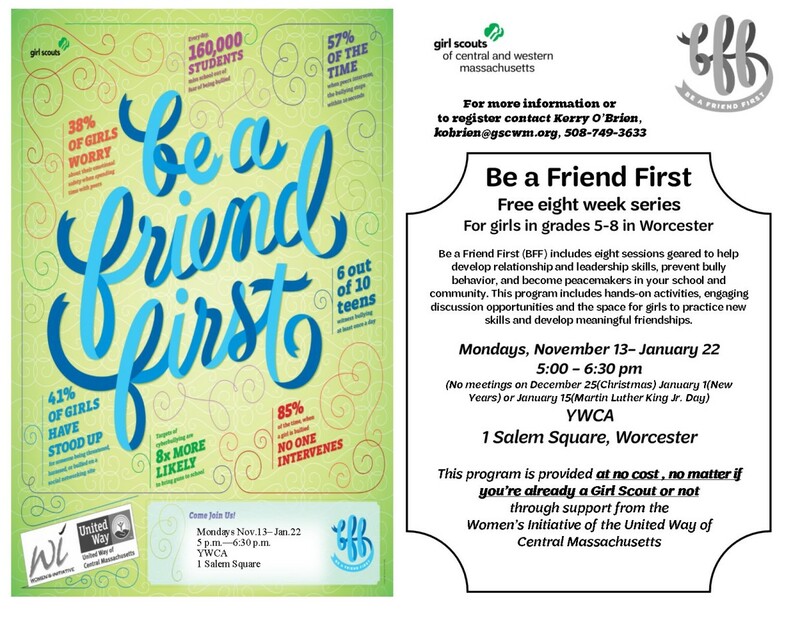 Thanks to the Women's Initiative of Central Massachusetts The Girl Scouts of Central and Western Massachusetts are proud to offer, at no cost, BFF: Be a Friend First, to 5th through 8th grade girls in Worcester, no matter if theyre a Girl Scout. Join us for this eight-session series at the YWCA Central Massachusetts, Mondays 5-6:30 pm, beginning November 13th. Did you know that every day 160,000 students miss school out of fear of being bullied? Additionally, six out of 10 teens witness bullying at least once a day. 85 percent of the time, when a girl is being bullied, no one intervenes. 38 percent of girls worry about their emotional safety when spending time with their peers. However, 57 percent of the time, when peers intervene, the bullying stops within 30 seconds. If you want to give your daughter the tools to prevent bully behavior, develop healthy relationships and leadership skills, and become peacemakers in their school and community, join us for BFF: Be a Friend First, by contacting Kerry OBrien to register. Call 508-749-3633 or email kobrien@gscwm.org. Girls will learn how to avoid bullying, cliques, peer pressure, stereotyping, and gossip by developing healthy relationships, leading through friendship, resolving conflict, and cultivating a strong sense of self.